All students enrolled in the college are assigned an academic adviser who will work with them as they explore their academic interests and potential career paths. Advisers assist students as they consider course scheduling options and ways to incorporate majors, minors, internships, education abroad, research opportunities, and other curricular and co-curricular experiences that will help them individualize their academic plans. When students have regular contact with their advisers, it gives advisers the opportunity to get to know the students better and understand their academic, professional, and personal goals in ways that will enable them to give the best possible advice as students navigate through each year and each stage of development. Parents should encourage their students to make an appointment to meet with their academic adviser at least once a semester. Also, if students have general concerns that do not require a full appointment, they can take advantage of available walk-in and e-mail advising. This not only helps the student stay on track with their educational goals but also provides an opportunity for them to discuss any difficulties they may be facing. 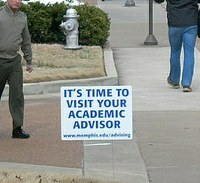 In general, the advising relationship is an important component of a student’s educational success. Advisers serve as mentors to encourage their advisees to become engaged in their education, guide them as they navigate a large university setting, and assist with expert advice and appropriate referrals if they are faced with difficult situations. Due to Federal requirements outlined in The Federal Educational Rights and Privacy Act (FERPA) University personnel, including academic advisers, are limited in what information they can provide to parents regarding their student. However, if parents have questions or concerns they may contact their student’s adviser for general direction on how to assist their student as well as receive appropriate referrals. More information on FERPA and Parent’s Rights to Education Records can be found on the Registrars home page.